Last Christmas Danni Clarke from Hereford, a 32 year old mum of four, suddenly paralysed by a rare brain condition faced a bleak future. But this Christmas the future looks much brighter. Danni who was diagnosed with Arnold Chiari Malformation, underwent brain surgery for her condition, where a lower part of the brain pushes down towards the spinal cord, but complications led to her losing the feeling and strength in her limbs. She was left numb from the chin down and faces life in a wheelchair. Following an appeal and the story about her plight appearing in the Hereford Times earlier this year the family were overwhelmed by the support and generous donations from so many people. After seeing the article the Hereford Lions Club, whose motto is ‘We Care’, got in touch to help raise the remaining funds for a specially designed wheelchair, which cost £3,300. 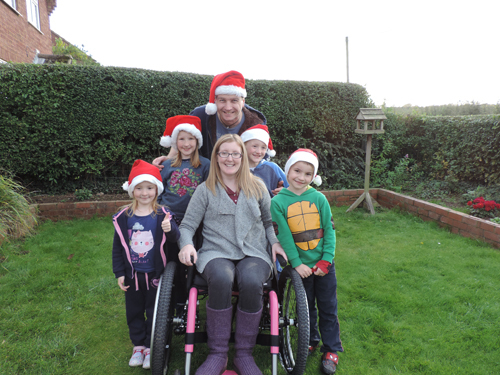 Not only has her wish for a super off-road pink wheelchair been granted so she can go on family rambles with husband Si and children Charlie, Hallie, Phoenix and Summer Raye, but she has also regained some movement in her legs. It has been a tough year for Danni who has undergone a series of operations, but she is still smiling and looking forward to a happy Christmas with her family. Hereford Lions Club, playing the role of Santa delivered the £3,300 life-changing all terrain wheelchair – a MT Push, which is a wheelchair designed to provide inclusive access to a wide variety of terrain, mud, gravel, grass, snow, sand and uneven pathways. years ago and she planted a tree in his memory, since losing her mobility she has not been able to go and see it, but now she can. 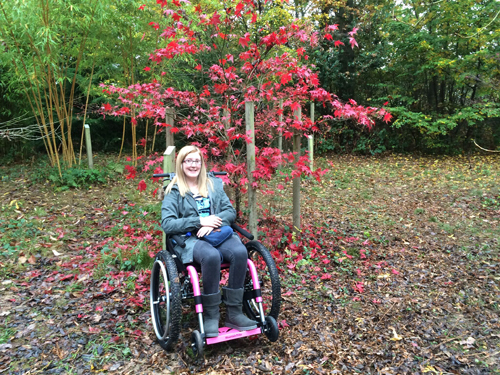 The off-road wheelchair has opened the door for her to get out and about and she is looking forward to lots of family outings to the woods and seaside trips to the beach. Lion, Mick Harman spotted Danni’s story in the Hereford Times earlier this year and asked his fellow club members to help and as the guy who sparked off the project, he was given the happy task of delivering the wheelchair to Danni’s home.